are eligible to apply for this NCLCIL Apprenticeship Program Recruitment 2018. Northern Coalfields Ltd is Subsidiary Company of Coal India Ltd. Currently these Trade Apprentices of Welder, Electrician and Fitter Trainees for the various units available in Uttar Pradesh and Madhya Pradesh of Northern Coalfields Ltd. 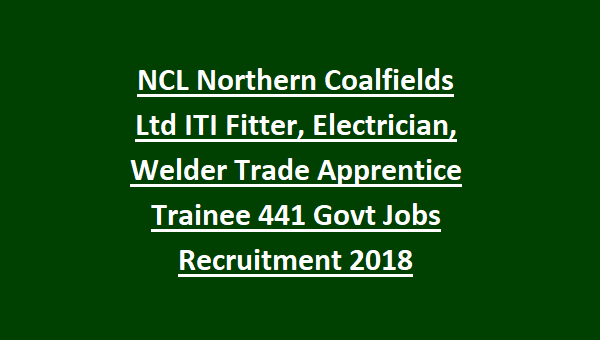 There are total 441 Trade Apprentice vacancies available in Northern Coalfields Ltd Bharti 2019. To apply for NCL Trade Apprentices candidate must have registered first at Apprentice training program DGET website www.apprenticship.gov.in under NCL. A registration number will be generated. 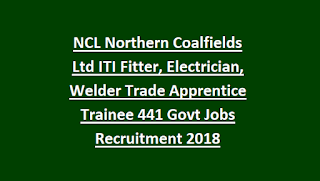 Using Apprenticeship Registration number you can apply for Northern Coalfields Ltd Trade Apprentices through online official website of Northern Coalfields Ltd www.nclcil.in on or before 12-01-2019 by 05:00 PM along with all required documents. Selection for this NCLCIL recruitment Trade Apprentice Trainee of Electrician, Fitter and Welder Posts will be through merit in 10th and ITI Exam marks. Northern Coalfields Ltd is a Mini Ratna Company. Currently NCL is recruiting the Trade Apprentice Trainees for its various unites located in UP and MP. If you are qualified ITI in the trades of Welder, Fitter and Electrician and you are seeking for Apprenticeship Program then it is a great opportunity for you. Compete details regarding NCL Northern Coal Fields Recruitment of Trade Apprentices 2018 is given below. As per Notification of Northern Coalfields Ltd, total Available Vacancies are 432. 2. For ITI Electrician, Welder and Fitter candidate should have pass ITI in their respective trade after 10th or 8th class. Minimum 16 years and maximum age limit is 24 years as on 01-4-2018. 5 Years for SC/ST and 3 years age relaxation for OBC candidates. As per the norm of NCL Apprenticeship Program. Northern Coalfields Ltd Recruitment of Trade Apprentice Merit List will be prepared based on ITI marks if required then 8th or 10th marks will be considered for preparing merit list. Candidates can apply online directly through official website of www.nclcil.in before the closing date of 12-01-2019. At first candidate has to register Apprenticeship Program on online through DGET website www.apprenticeship.gov.in and apply as Apprentice Protsahan Yojana APY Candidates. A registration number will be send to your mail Id. Now download application form from NCLICL website and using that registration number fill all the required information. Send the application form to Northern Coalfields Ltd Along with all documents of ITI/8th/Caste/Date of Birth and if any other to below given address to be reachable on or before 12-11-2018 by 05:00 PM. On cover letter mention "Application for Fitter/Welder/Electrician Trade Apprentice" and send through Speed or Normal Post.